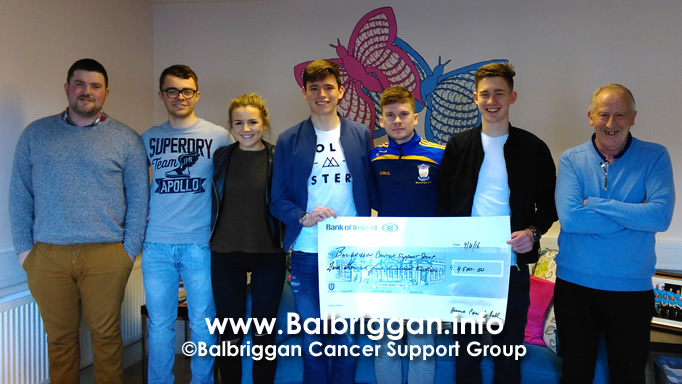 Balbriggan Cancer Support Group wish to say a big thank you to Peter and all the guys involved in the Home Charity Ball which raised €4,500 for Balbriggan Cancer Support Group. This event has been run for the past 3 years and has raised €14,800 in total – €5,300.00 for the Irish Cancer Society and €9,500 for Balbriggan Cancer Support Group. To raise this amount of money on a purely voluntary basis is tremendous on the part of all the young people involved selling tickets getting spot prizes and sponsorship,our young people do not always get the credit they deserve this achievement is testament to all the young people involved. Again a sincere thank you on behalf Balbriggan Cancer Support Group to one and all and wish all the guys every success in the future..